The Centennial anniversary of the Russian Revolution of 1917 provoked many historian’s will to look once more to the complicated problems of political transition that had place many decades ago. The Russian Revolution and the catastrophic Great World War destroyed Old Order which seemed to be so harmonic one, to be the world of progress and consequent human evolution. The Revolution not only managed to change Russia itself, but also to influence significantly over whole the world. This influence has had many repercussions in different parts of our planet. The formation of the USSR and world communist movement (presented by the Comintern) were the bifurcation points which defined the history of the humanity in the 20th century. The Revolution of 1917 and the birth of powerful Left-Wing and Communist movement have changed enormously the social history in different continents, and Latin America was no exception. Latin American continent is the place where the revolutions of the 20th and 21st centuries is not only the object for historical analysis, but also for the contemporary reflections. Today many achievements and failures of the Left-Wing and Communist movement still are in the center of attention of historians and of society in general. 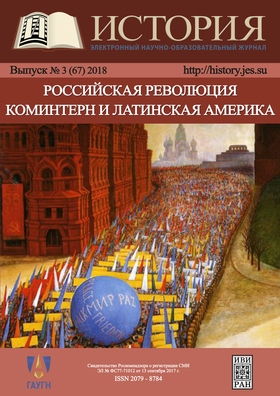 The main challenge for the authors of this volume was to study the influence of the Russian Revolution on the formation and development of the Left-Wing and Communist movement in the Latin American continent between two World Wars, i. e. during the existence of the Communist International. The authors of the articles presented in this issue — historians from a number of leading universities and research institutes in Argentina, Brazil, Mexico and Chile — participated in the Latin American section of “The Revolution of 1917 and its Place in the History of the 20th Century” international conference held in September 2017.